Who are we, what do we do, and how to contact us. To work with the Library to help maintain and enhance the Collection and its services to the public and, in consultation with the Library's staff, to advise on issues pertaining to the Collection. To raise funds for special acquisitions for the Collection, for the improvement of the physical facilities and for other special projects. To promote and carry out programs and activities designed to raise awareness of the existence and contents of the Collection and to provide educational activities for members. To act as a resource for the Collection and private collections in Canada and elsewhere, in consultation with the Library staff. To work cooperatively with The Bootmakers of Toronto and other organizations dedicated to Sir Arthur Conan Doyle and his works. You can read more about the history of the Friends in this article (PDF format), reprinted from the Friends newsletter, The Magic Door. Our journal, The Magic Door, published three times a year, brings you fascinating articles about the Collection and news about Friends' special events. The publication's name comes from the title of a volume of Conan Doyle's essays about his favourite authors. You can sample an issue here (2.4MB PDF file). A notebook containing Conan Doyle's jottings for characters, plot, dialogue and settings on Nelson and Napoleonic Wars. (Donated 2012). The manuscript of Conan Doyle's Brigadier Gerard story "The Marriage of the Brigadier." (Donated 2013). A collection of 11 letters from Conan Doyle to his wife, Jean. (Donated 2011). 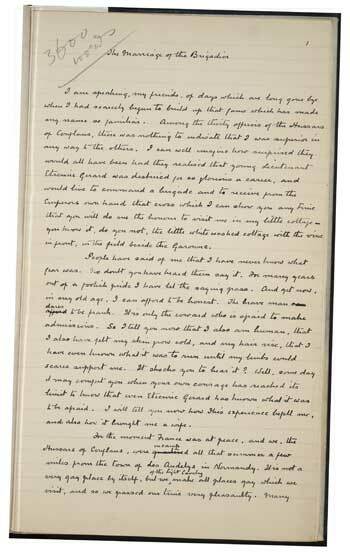 The manuscript of Conan Doyle's early play "Angels of Darkness"
A notebook containing notes of Conan Doyle's domestic accounts and other financial matters. Membership and other donations on an ongoing basis make these purchases possible and allow the Collection to acquire valuable literary and biographical treasures beyond what its budget would normally allow. We also organize public events from time to time, to illuminate the life and works of Arthur Conan Doyle and to highlight some of the Collection's treasures. Information about our upcoming events is online here. In 2002, to honour the memory of Cameron Hollyer, the first Curator of the Arthur Conan Doyle Collection, the Friends established the annual Cameron Hollyer Memorial Lecture. Since its founding, the lecture has seen a stellar series of informative and entertaining talks on Conan Doyle and his work by highly respected authors, scholars and performers. We have published all lectures since 2008 in pamphlet form (except for 2016), of which a limited number of copies are available for purchase. Find out here how you can order copies. 2002 – April 20: Isaac Gewirtz, Curator, Berg Collection, The New York Public Library: "The Berg Collection: A Tale of Literary Taste and Scholarship." 2003 – March 22: Jeannette Sloniowski and Marilyn J. Rose, Brock University: "The Crime Fiction Canada Project." 2004 – April 3: Maureen Jennings, crime writer: "My Life with Sherlock Holmes and ACD." 2005 – April 21: Christopher Redmond, University of Waterloo: "Welcome to Canada, Mr. Sherlock Holmes: Conan Doyle's Visits to Canada." 2006 – April 1: Glen Miranker, Doylean Collector: "When is a Book More Than a Book?" 2007 – April 14: Peter Robinson, crime writer: "Worthy Successors: Sherlock Holmes as Inspiration for the Modern Crime Novel." 2009 – April 25: Michael Dirda, journalist and critic: "The Press is a Most Valuable Institution: Conan Doyle as Essayist and Journalist." 2010 – May 29: Peter Calamai, journalist: "The Real World of Sherlock Holmes: How does historical London of 1895 compare with the London described by Arthur Conan Doyle in the Sherlockian Canon?" 2011 – April 30: Tom Ue, English Language and Literature PhD student at University College, London: "Sherlock Holmes and Shakespeare." 2012 – September 15: Roy Pilot, Doylean scholar and author: "The Lost World Revisited." 2013 – May 4: Professor Bernard Lightman, York University: "Conan Doyle and the Scientific Naturalists." 2014 – May 3: Lyndsay Faye, author and Sherlockian: "Sir Arthur Conan Doyle: Storytelling and the Passion of the Narrator." 2015 – June 27: Clifford Goldfarb, Doylean scholar and author: "Arthur Conan Doyle's Waterloo." 2016 – May 28: Professor Russell Merritt, University of California, Berkeley: "A Sherlockian Legend: William Gillette On Screen."